Today is the 2nd annual World Bipolar Day, an event that strives to educate the public about bipolar disorder and encourages an open discussion to end the stigma associated with brain illness. There’s a facebook page where people can share stories, and there’s lots of links to different organizations. It was chosen to fall on this day because it’s Vincent Van Gogh’s birthday. He is said to have suffered from bipolar disorder, and he committed suicide at age 37. Bipolar disorder is fairly rare – roughly 1% – 2% of the population are bipolar. Some estimates say up to 5%, but there is this sense that it’s over-diagnosed. When I have questioned in therapy whether I am bipolar, she has replied something to the effect of, “That was a very popular diagnosis then. A lot of teens were being diagnosed.” Sometimes people think they have it because their moods are extreme; really something else might be going on. I thought I’d take a minute to reflect today about whether I am bipolar or not. I mean, I did just go through a delusional manic episode 2.5 months ago, no doubt about it. And I am currently sinking through a rebound depression – definitely a clinical level depression. But I strongly do not think I am bipolar. It’s been 15 years in between episodes, and I’ve only ever had 2 episodes. Much of that time I’ve been off all medications. I can accept that I have bipolar-like tendencies (and I’m hyper-sensitive to stress levels), but I don’t think I fit the criteria, nor do I think I need to be medicated long term. In fact, I plan to go off my medications in a couple of months once this passes and I feel like myself again. My new psychiatrist told my partner, “Once a bipolar, always a bipolar.” Meaning, I’d been (mis? )diagnosed already (at age 17), and there’s no taking that back. ??? He thinks I need to be medicated forever. He doesn’t get that I’ve been stable and have managed issues in my life in other ways for a long time. I’m pretty sure someone who is really bipolar doesn’t get to do that. I can’t imagine what it would be like to actually be bipolar. To have to balance a medication cocktail indefinitely or suffer the consequences. Because when you’re actually bipolar, you can have an upswing or downturn without much prompting, if you’re un-medicated or if the medications are not right for you. If I was pretty sure I would be going through more mania and more depression in the near future, I would be living in fear of that. I honestly do believe I am prone to going through mania and depression again, but to a much lesser extent than someone who actually has bipolar disorder. And that’s scary enough. One other factor that makes me think I have bipolar-like tendencies has been my reaction to SSRIs. I took Paxil for a few weeks about 13 years ago, and it caused me to feel super agitated and become hypomanic. Apparently this will happen if people with bipolar disorder take SSRIs. I do take this seriously, but ultimately I’d have to say I do not have bipolar disorder. Today I’m thinking about everyone who actually does. I’m on a 2 week leave from work again right now. I was basically planning to just push through depression and just go through with obligations and routines. That’s what I tend to do. But I was switching medications, and I really hit a wall. 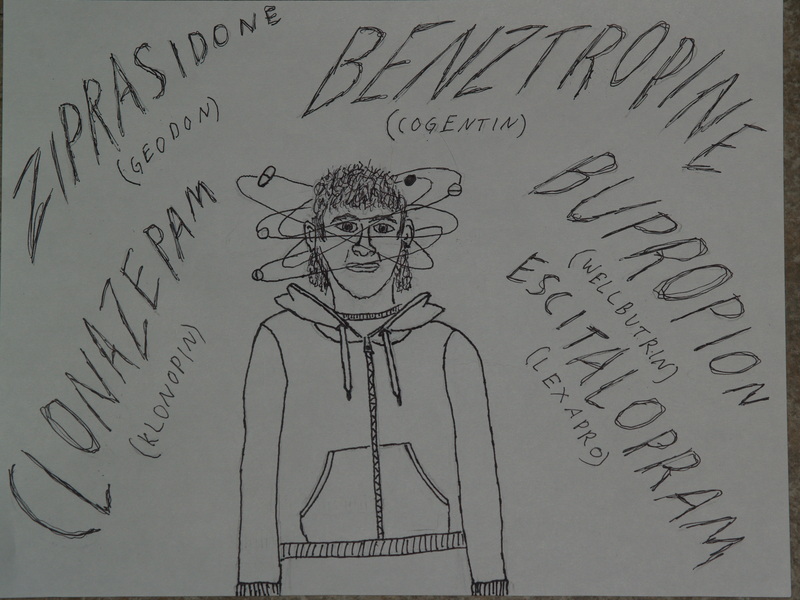 I had been on Geodon, and was switching to Latuda (both atypical antipsychotics). The Geodon was causing some strange hormonal side effects, so for 2 weeks, I was on a half dose of that and a half dose of this new one. That was working out OK. Switching to a full dose of the Latuda really set things off though. I couldn’t sleep and was starting to feel agitated. Depression plummeted and anxiety skyrocketed. Last night, I threw up an hour after taking the pills. I had a therapy appointment yesterday, and going out of work again was her idea. As soon as she said it, it sounded like a good idea. Why didn’t I think of that? Haha. I have plenty of sick time; might as well use it when I actually need it. I really do not know what I’ll do for two weeks. (OK, I do have some ideas – I can get my car recalls taken care of, I can start thank you cards from our party last summer, I can give my friend a hair cut, I can try doing some writing, I can just take it easy.) I feel relief. I just feel trapped in by medications right now (side effects are weird! I’m a small person and I feel the dosing has just been way too high! ), and by my psychiatrist because it’s all his call. I thought the Geodon could be OK if I were on less of it. He decided we’re not going to lower it, we’re going to switch drugs instead. Now I have to call him and tell him that’s not working out. I really just want to be on Geodon, just less of it. I really hope he listens.